Jersey City, Newark and Bayonne Roar with the NJ Highlands Coalition! (Left to Right) Jersey City Mayor Steve Fulop, Elliott Ruga Policy Director NJHiCo, Jennifer Coffey, Executive Director, ANJEC, Rev. 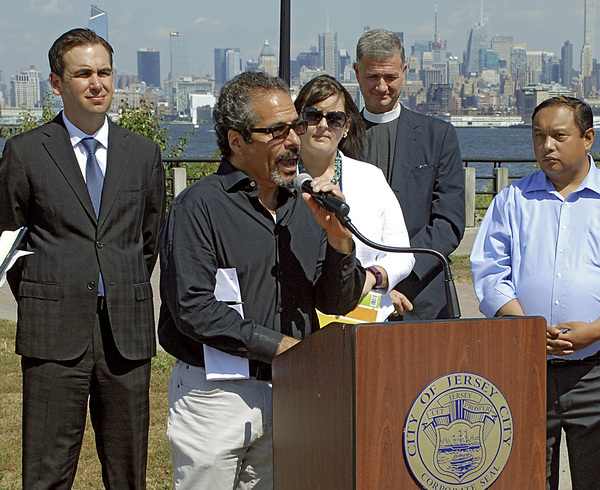 Fletcher Harper, Executive Director, GreenFaith, Jersey City Council President Rolando R. Lavarro, Jr.
With Jersey City’s gold coast in view, New Jersey’s two largest cities joined with prominent environmental organizations and religious leaders to call on Governor Christie and NJDEP Commissioner Martin to drop plans to weaken the rules that restrict development in the Highlands Preservation Area, the 425,000-acre, nearly contiguous forest, which acts as a huge, natural, water filtration system, providing clean drinking water for 70% of the State’s population. "It is immoral to undermine those protections, it is wrong to take steps that put millions of people at risk, simply for the private gain of a few, and it something that is unacceptable to the faith communities of this State. I am here today to represent my Christian, Jewish, Muslim, Hindu, Unitarian and Humanistic brothers and sisters from across New Jersey to stand with the elected officials and the environmental leaders here to make it very clear that the proposed changes are wrong, and that we will fight to oppose them...we oppose those steps in the name of God. Amen." said the Reverend Harper Fletcher, Executive Director of GreenFaith. Driving home the widespread concern that exists across the entire State for maintaining the high quality of drinking water supplied by the Highlands, the New Jersey Highlands Coalition also announced that over 100 municipalities, counties and commissions have passed resolutions of support for the 2004 Highlands Act, the legislation that recognized the Statewide economic significance of the Highlands and mandated the formation of the Highlands Council, that along with strict limits on development implemented by the NJDEP, would secure the water resources of the Highlands for present and future generations. Are you involved in your community’s environmental issues? Do you attend regular meetings on issues in your municipality? 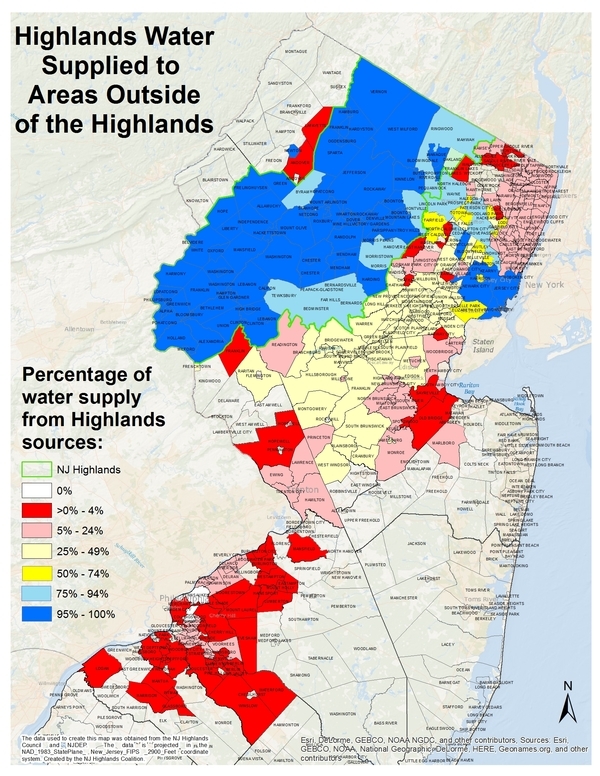 Would it be helpful to have the support and coordination of the NJ Highlands Coalition for your efforts? If so the Highlands Advocates program is a perfect fit for you. We are looking for active environmental volunteers to join our network of Highlands Advocates! Over the past several years, the NJ Highlands Coalition has been working with and seeking out people active in their communities within the 88 Highlands municipalities. Our goal is to partner with at least one individual in all 88 municipalities enabling us to have a strong presence across the Highlands through our team of Highlands Advocates. 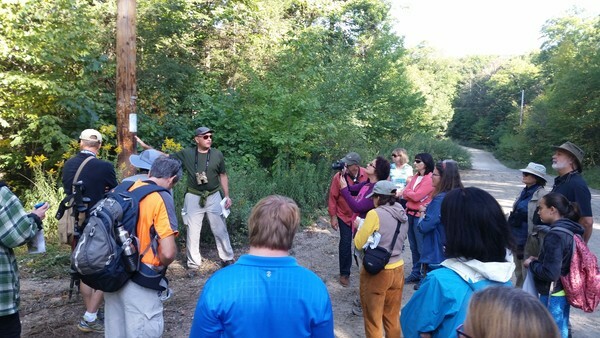 Hikers were guided by Dennis Miranda, well known conservationist and environmental leader, through the beautiful and ecologically significant Hamburg Mountain Wildlife Management Area this weekend on a lovely, sunny Saturday morning. Hikers were guided over the mountain, while being shown significant ecological areas of the WMA and learning about their importance to NJ's natural heritage. Dennis spoke of the many different species of birds that are present and threatened on the mountain. He also wow'ed hikers making owl and other bird calls and sharing interesting stories of the evolution of the WMA over the years of developmental pressures it has and continues to face. The important takeaway from the hike was that NJ's forests cannot handle the developmental pressures and proposed forest stewardship proposals that other larger forests may be able to afford. Rally begins at 10:30 a.m at the Pavilion at Schooley's Mountain Park, Washington Twp., NJ. Come enjoy about 75 miles of spectacular roads and scenery. The rally will test your ability to follow precise instructions along an intricate course at legal speeds on little-used public roads. This is not a race. Please plan on staying after the rally for lively discussion and the presentation of prizes. Proceeds from the rally will benefit the New Jersey Highlands Coalition and its member organizations. 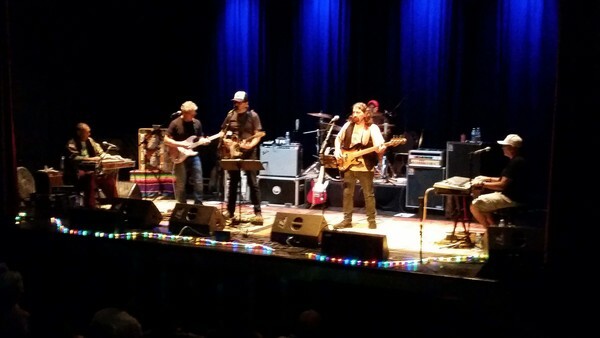 On Saturday September 17th Roy's Hall in Blairstown, NJ hosted a benefit concert for the NJ Highland's Coalition, headlined by The New Riders of the Purple Sage. Roy's Hall offers a very intimate theater with amazing acoustics, which gave way to a fun filled night packed with classic rock and roll music. We would like to thank all attendees and donors as well as the New Riders of the Purple Sage for your continued support and involvement with the NJ Highlands Coalition's mission of protecting clean water and preserving land of NJ for future generations. 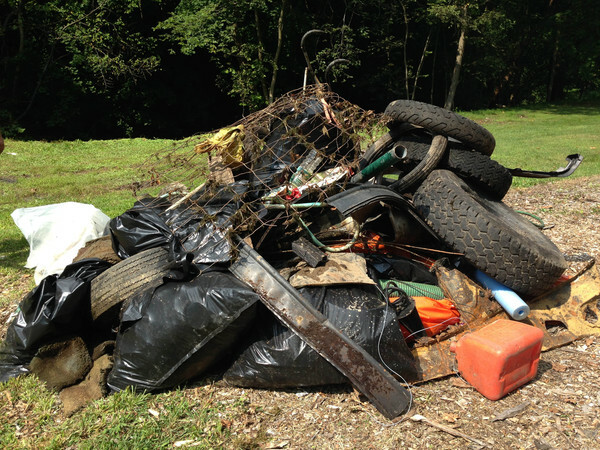 The 3rd annual Lopatcong Creek Cleanup is scheduled for this Saturday, Sept.24 at 9am. Volunteers should dress appropriately at meet at the lot adjacent to Norton's Cork n' Bottle (1016 South Main Street, Phillipsburg 08865). Visit our Facebook page for additional information: Lopatcong Creek Initiative. Uphold the Highlands: Over 100 Resolutions Including Jersey City and Newark! George has been successful in his attempts to recruit municipalities that depend on Highlands water, and help them understand the importance of protecting this essential resource. So far over 100 resolutions in support of the Highlands have been passed, including by two of NJ's largest cities Jersey City and Newark! This is a very positive networking effort. If you have any news or ideas for your community regarding actions such as these in the Highlands that might aid our efforts, contact George Stafford at (george@njhighlandscoalition.org). Even more helpful would be if you will introduce George to any personal political contacts you may have. He has been having great success, but we have a long way to go and we still need your help! The Highlands Council Sep. 15 HDC bank board and Sep. 29th regular council meetings were both cancelled.